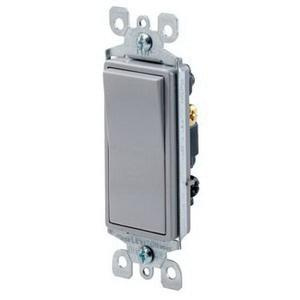 Leviton Decora® Residential-grade rocker AC quiet switch in gray color, has voltage rating of 120/277-Volts and current rating of 15-Amps. This 3-Way switch features sturdy thermoplastic construction for enhanced durability. It measures 4.2-Inch x 1.3-Inch x 0.99-Inch. AC Quiet switch is equipped with switch frame that efficiently shields from dust. Wiring options include Quickwire® push-in and side-wiring for quick installation. Quickwire® Push-in terminals of this switch accept 14-AWG solid copper wire, while the terminal screws accept up to 12-AWG copper or copper clad wire. Rocker AC quiet switch ensures full rated current capacity with tungsten, fluorescent and resistive loads. It is self-grounded when installed in properly grounded metal wallbox. Switch has maximum load capacity of 1/2 hp at 120-Volts and 2 hp at 240 - 277-Volts. This switch firmly fits in wallplate to prevent rocker binding. Rocker AC quiet switch withstands temperature rating of -40 to 120 deg C. It has flammability rating of V-2 per UL94 to withstand harsh environment conditions. 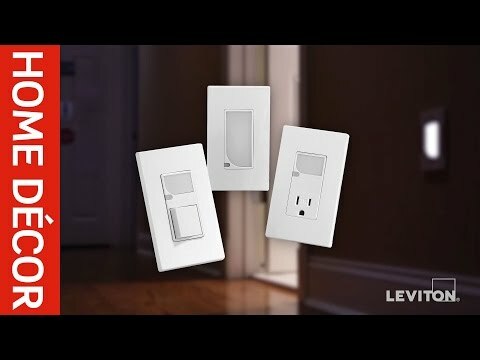 Switch is UL listed, CSA certified and meets NOM 057 standards.